Football clubs over the last twenty years have operated under a simple business model: win matches, and the fans, sponsors and prize money will follow. 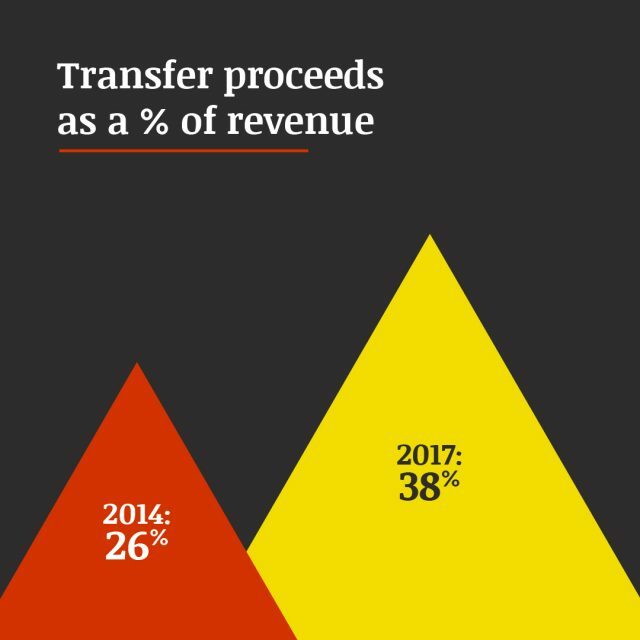 And yet while these income streams are bigger than ever, clubs all over the world are now increasingly dependent on a fourth source of money: the transfer market. According to UEFA’s Club Benchmarking reports, in 2014 transfer proceeds were worth 26 per cent of total revenues in Europe’s top 15 leagues. The latest released figures from 2017 tells us that figure is now 38 per cent: clubs have increased their dependency on transfer income by nearly 50 per cent in just three years. A combination of factors explain this change. 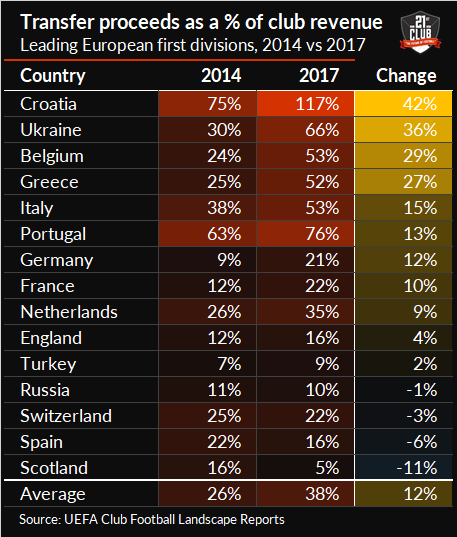 Income growth in the big 5 leagues and UEFA competitions means top clubs can now more aggressively pursue targets in medium and smaller leagues, where clubs are increasingly hamstrung by stagnation in the traditional income streams. Ten years ago a talent like Frenkie de Jong may have stayed at Ajax for a few more years, but now the migration of talent from small to big leagues feels inevitable. This new state of play sits uncomfortably with many. While transfer revenue is up at an aggregate level, at an individual club level it remains highly unpredictable. An unanticipated stall in the quality emerging from the academy, or a couple of unsuccessful transfer windows means clubs face increasingly large fluctuations in income and performance. But if this is the new normal, clubs will need to respond accordingly. For those outside the major leagues, investments in the academy and recruitment processes are timely. Spotting undervalued players – a real passion of ours – and selling on for profit is already far more important than finding a new sponsor or opening a new club shop. Meanwhile, innovation in competition design may help grow broadcast and matchday revenues to reduce those unwanted fluctuations in income. There’s even opportunities for small and mid-sized clubs in the top leagues to insert themselves into football’s food chain and take advantage of transfer revenue growth. Even the very best young talent needs a path through to the very top, and smart clubs will find a way to position themselves in the market. Regardless of our club’s status and size though, the trend – and opportunity – is clear: player trading is set to be a big part of all clubs’ business models over the coming years.